Clean Water is necessary for the survival of most living things. It’s not just the water we drink that is important, but also water that we are exposed to through bathing, cooking, and recreational activities like fishing, swimming, and boating. These exposures can affect our health. When the streams are polluted, fish and wildlife that rely on those water systems are also impacted and this can negatively affect us in the long run. 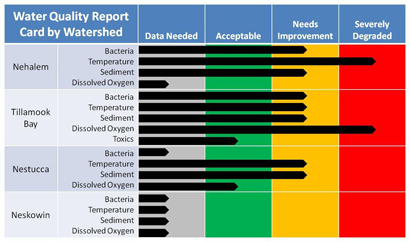 Water quality standards are developed by scientists to provide protection for the uses that are most sensitive to pollution. Water pollution can take several forms. 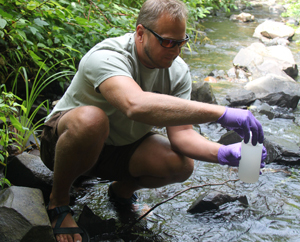 The pollution that affects waters in Tillamook County watersheds are bacteria, sediment, temperature, and dissolved oxygen. High bacteria levels in water can spread diseases to people who come in contact with it through recreation, food, or drink. High levels of sediment in waters can limit drinking water and make it more costly to treat. 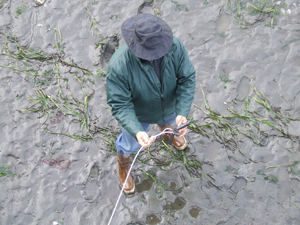 Sediment can harm salmon eggs and aquatic bugs that are a food source for salmon. High water temperature and low dissolved oxygen will also harm salmon because they are not able to thrive in these conditions. TEP has several monitoring programs that track the levels of these types of pollution. The Volunteer Monitoring Program, which began 1997, relies on local citizens to collect water samples to measure bacteria levels. TEP, as well as its partners like State and Federal agencies, use the large data set collected by volunteers to make decision and document improvement. TEP has seen improvement in many of our streams though this monitoring effort. TEP also has two other monitoring programs that measure temperatures and dissolved oxygen in rivers and streams as well as the bays in its study area. These programs allow TEP to determine if our streams and bays are providing quality habitat for all stages of salmon lifecycle. 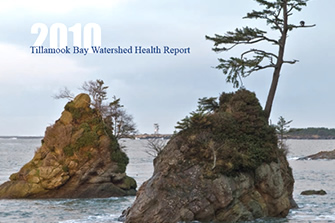 Please contact York Johnson at 503-322-2222 for more information or refer to TEP’s 2010 Tillamook Bay Health Report and DEQ’s North Coast Water Quality Status and Action Plan report and summary sheet. TEP is working on several more specific water projects. These projects are designed to answer questions about possible source of pollutions, explore new monitoring techniques or collect data on new substances that may be affecting use of water. 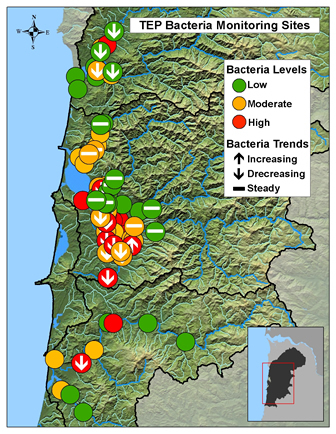 Tillamook Bay Watershed bacteria trend monitoring. Symbols represent E.coli standards status in 2012 and trend from 1997 to 2012.